Teaching is a selfless act. As a dance educator, you put your students’ needs ahead of your own. You give your time, talent, and resources to ensure their success, in and out of the studio. While your passion and dedication makes all the difference for your students and for the field, it is important to take time to care for you, as well! Make 2019 the year that you invest in yourself. NDEO has the resources and opportunities you need to find inspiration, refresh your teaching practices, get support, and advance your career. Take advantage of all that NDEO has to offer in the coming year, including in-person and online opportunities to further your knowledge, refine your teaching skills, and connect with dance education professionals internationally. Emerging Pathways within Somatic Movement and Dance Education, a new NDEO Special Topic Conference in partnership with the International Somatic Movement Education & Therapy Association (ISMETA), June 21 - 23, 2019 at Gibney Dance Agnes Varis Center for the Performing Arts in New York City. Jazz Dance: Hybrids, Fusions, Connections, Community, a Special Topic Conference bringing together a community of jazz artists, educators, and practitioners to share and deepen their understanding of what jazz dance is today, in all its vibrant shapes and forms, and how it might continue to evolve. July 30 – August 2, 2019 at Salve Regina University in Newport, Rhode Island. 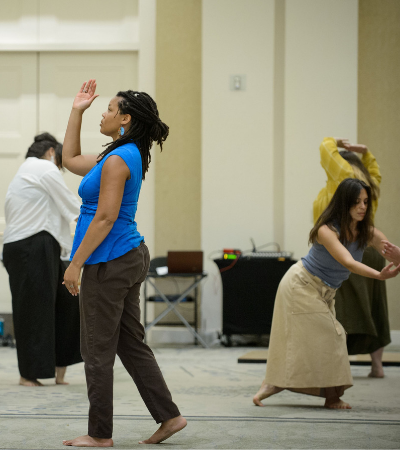 The Creative Process: Choreography, Choice-Making, and Communication, NDEO’s 21st Annual National Conference, October 23 - 26, 2019 at the Hyatt Regency Miami in Miami, FL. If your New Year’s Resolution is to stay up to date in latest in dance education research, The Journal of Dance Education and Dance Education in Practice should be at the top of your reading list! A subscription to these NDEO journals are included with most member types; visit www.ndeo.org/membertypes for more information. This year, we are excited to introduce new one-click online access to these publications. Members can now navigate to the publication from the NDEO website after logging in with membership username and password, no need to remember a second login for the Taylor and Francis website. If you are not yet a member of NDEO, this is the perfect time to join! When you join NDEO, you get connected to a national network of dance educators working in every sector of the field, and get access to member benefits including online forums, job postings, awards and scholarships, publishing opportunities, and more. More importantly, you become a part of a dedicated community working for the advancement of dance education and access to quality dance arts education for all, regardless of gender, age, race or culture, socio-economic status, ability or interest. This year, invest in yourself, and find the support and inspiration you need to take your career to the next level. *Separate fees apply for conference registration and online courses.